I want to start down the french BB line so I"m looking at the Dunkerque loaded because not only do you get a port slot you also get 3,000 gold and a six point captain. Even if this is just an average ship is it worth getting at it's current price? My friend got it and seems to really enjoy it! I like the Dunkinhole It has a different play style but has many benefits because f it. People tend to say its a fun ship. I like it and could be a good captain trainer for your French BB line, and french captains in general. Will also get you experience for whenever you reach the Richelieu. Overall, get the Dunkerque if you're also looking for something different in a BB. I got it in a Santa Crate 14 months ago I think! Not Sure. It is very easy to play do to many things that it should not do. Myself and others posted our opinions under the Battleship sub forum on various Dunkirk threads. I am only using it to get a 19 point French Captain. I do not see any other uses for it. Maybe as a trainer for similar main guns only on front ships? Dunk is a love/hate ship. If like the bow on playstyle, you will like her. If you can afford it, go with gascone. Have had the Dunk for about a year - one of my weakest tier 6 BBs. If you are getting as a captain trainer for French BB, ok purchase. Really struggles when up tiered, guns can be wonky, especially ap, so spend a lot of the time he spamming. 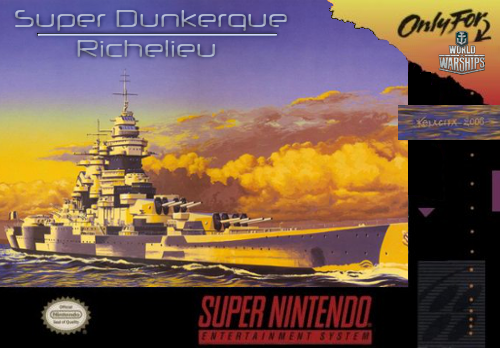 If you cant get the Nelson, and dont wanna grind for Izumo or Richilieu, then Dunkerque is the way to go. I love how all the guns face forward on Dunk. I play it almost always forward/backward, instead of left/right. You dont need to deal with broadsides or anything. Here, watch Yuro's guide and see if you like it before buying! Personally I like mine, its fun! Also, you may want to consider checking out Little white mouse's guide on it too. shes like the queen, when it comes to making reviews! Dunk is better choice than Gascogne if you are just starting a line and don't have a trained captain. You will miss those skill points fighting Tier 9s and 10s. Dunk is fast, maneuverable and is great at deleting cruisers. Her AP is fine versus Tier VII and VIII BB, or do like a lot of folks and spam HE. Lots of opinions in the thread, YMMV. IF you're looking to use it as a French trainer, the consensus is that it's a better BB trainer than the Gascogne simply because at T-6 you can get away with not needing a 10+ captain. T-8 MM should be a consideration as well - potentially you can do better with the Gascogne, but facing T-10 with 380mm guns can be challenging. Dunk's got all the guns up front, wonky dispersion, poor armor and catches fire easily but it's quick and fairly nimble for a BB. It does require a different play style to make it effective. if you're just looking for a French trainer and can play cruisers, the De Grasse is a good option since you can potentially train not only BB, but DD and C captains as well. I used to love my Dunkerque... now I hate it. The bow-tanking meta just isn't my cup of tea. IMO, in terms of flexibility, tankiness, secondaries, and gun performance, the Mutsu/Warspite are far, FAR better tier 6 premium battleship options. Consensus? Where? I disagree with this statement in its entirety. The Dunkerque is fragile and has very unpredictable guns. She also only vaguely resembles one other ship in the French tech tree. Gascogne looks and feels like the majority of the tree - Dunkerque does not. Consensus? Where? I disagree with this statement in its entirety. 380 mm guns at T-8 vs 330 at T-6. Pick AR or EM. T-6 MM is more forgiving. While torp protection for both isn't great, you're going to see much more damaging torps at T-8 than T-6. At t-8+, you're not going to see a DD unless he wants to be spotted. At T-6 you at least have a chance to see some of them before they torp. $66 vs $36. Dunk is better bank for the buck. Now if you're an experienced BB player, are used to T-8MM, can play with the worst DPM BB guns in it's tier, have a high point captain that you want to earn more points for, then yes, the Gascogne will make more XP than the Dunk for similar performance. For whatever reason, pound for pound, tier for tier, the Dunkerque is one of my best BBs. It's play style takes getting used to but it performs very well. The Dunkerque loaded is a pretty good value in my opinion as well. The ship is a lot of fun and the price is relatively cheap. People keep saying it's a bow tanker. It really isn't. Richelieu can do that. Dunkerque doesn't have the armor or the guns for that. I see people doing that all the time and they just get sunk. It's a fast flanker. It plays best when you use your speed to get to a position on the enemy flank where it can harass enemy BBs and cruisers and support allied cruisers and DDs on the move. Play it like Kongo (it is about as durable) but with better weapon arcs for fast attacking. The gun layout helps you keep angled against enemy BBs while on the move. Dunkerque can't tank a lot of damage. It needs to be on the flank and moving. Play it like a well-armored CA not a BB. Dunk is one of my most played ships that I still can't get my win rate over 50% in, but I find it a fun ship. Watch the How to video posted above and there is a useful thread with video by @Sventexon how to play Dunk in a T8 match which happens a lot (Deconstructing Dunkerque guide). If the opposing team BBs are armed with guns no larger than 356mm, then you can bow tank them like crazy and if you angle right, you'll laugh at the number of AP rounds you bounce. She is good at flanking and supporting a push as long as your teammates don't bail on you. Her secondaries get a bad rap due to their positioning, but you can have fun with DDs that get too close or while you run away from them. Her speed can and will get you into trouble, but she is decent at dodging air dropped torps. Never give up your broadside or she folds fast. You have to keep a watchful eye on the minimap and see which way the enemy BBs guns are pointing before you try any large maneuvers. Also, while you may enjoy some limited success at brawling a Fuso or NY and deva-striking them, she is not a brawler. Dunk is a battlecruiser in all regards. Also, she has terrible concealment, so drive her like a big Russian cruiser with BB guns. Or any other cruiser with poor concealment. I used Dunk as my main ship in last July's Ranked and did damn good with her. I find Dunk to be a fine ship though her shell dispersal is really wonky. Sometimes you get a nice tight pattern and other times the shells spray all over creation. And... She has NO park benches! Once you get the hang of her unique playstyle due to the turret setup, I think that you'll have a lotta fun and do well. Its a great ship as long as you know how to position youself properly in a battle AND know by heart which ships can overmatch your bow. The better you are at reading the field, the better results you'll have with it. You need to know when to advance, when to pull back and how to turn around without being citadeled 5x in the process. Dunk is a battlecruiser, and you will be facing battleships, they will have more armor and bigger guns than you so you need to be smarter.